Basant Panchami is also celebrated as 'Saraswati Puja' in many communities. Saraswati Puja 2018 would is being celebrated today. Its the end of the biting cold days. Spring has come knocking on our doors and the entire nation is leaving no stones unturned to welcome the 'king of seasons' in all its glory. Hindus around the country are celebrating Basant Panchami today. Basant Panchami celebrates the onset of spring and harvest. Basant Panchami is celebrated on the fifth day of Maagh (a month in the Hindu calendar). The word 'Basant' means spring and 'Panchmi' denotes the fifth day on which the festival falls. Basant Panchami is also celebrated as 'Saraswati Puja' in many communities. On this auspicious day, Hindus pay respect to Maa Saraswati. Goddess Saraswati is said to be the Goddess of knowledge, hence the occasion is especially looked forward to by the students. On this day they place their books on the feet of the idol and seek her blessings. In some communities, toddlers are also introduced to writing on the auspicious occasion. People who are involved in music also seek the divine blessings of the deity, since Maa Saraswati is also said to be the Goddess of art, music and culture. Like every festival, preparations of Saraswati puja also begin days in advance. Clay models of Godess Saraswati, holding her Veena (musical instrument) sitting atop her swan are made and shaped by hands of skilled sculptors. The Goddess is decked in beautiful clothes and accessories. The colour yellow is considered to be a very pious colour for the occasion. The color of Basant (Spring) is yellow, also known as the 'Basanti' colour. It symbolizes prosperity, light, energy and optimism. People dress up in bright yellow clothes, cook yellow coloured dishes like 'Meethe Chawal', Rajbhog, Kesaria Sheera, Besan Ladoo, Khichdi. Goddess Saraswati is also offered yellow coloured flowers. She is also offered a host of fruits. Ber or jujube is believed to be her favourite. In fact, amongst Bengalis, it's a common tradition of having their first jujube of the season only after they have made the offering to the Goddess on Saraswati Puja. On the auspicious day of Saraswati Puja, Hindus wake up early in the morning, take a bath and head to the nearest pandals celebrating Saraswati Puja. Some of them also choose to celebrate the occasion at home by bringing home the idol of Godess Saraswati and offering her a prasad of fruits, her favourite flowers and Bhog. Many do the Saraswati Vandana and seek her divine blessings. In the evenings several pandals arrange cultural programs, competitions and games. Many of these gatherings also serve delicious food. 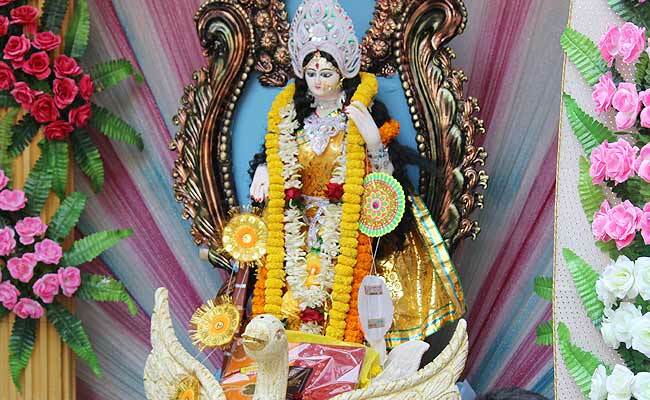 Basant Panchami Puja Muhurta: 7:16 a.m. to 12:32 p.m.